Gerald Lewis, our otherwise jovial taxi driver, is vexed about the price of oil in Belize as he fills up the tank of his creaking Toyota. He also fixes a new windscreen wiper before we head out on the road through the Belize River Valley, and it proves a decent purchase. 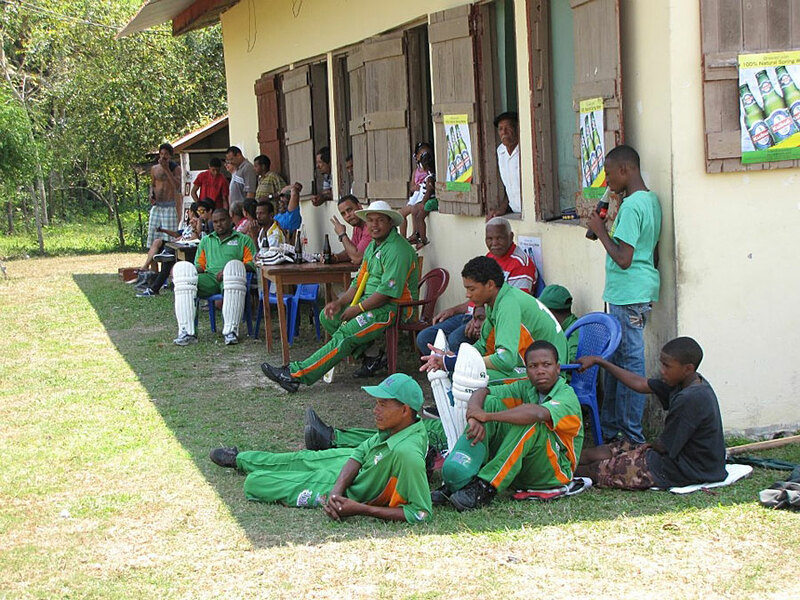 We had hoped to catch an Under-15 cricket tournament at Lord's Bank village, but the rainy season had stretched on longer than usual, into mid-November. So the stands were empty, the wicket and outfield untrimmed, and a despondent groundsman huddled in the doorway of the hurricane shelter next to the field. During the league season, which runs from February to August, they have a remedy for tropical downpours of this kind: diesel is sprinkled on the damp wicket, then set alight, leaving a scorched and dry surface, often every bit as playable as the original. "There isn't a cricketer here who wants to drop points on another team down the road," said one long-time follower of the game in the rural areas. The roadsides in the valley are dotted with lumberyards, remnants of the lucrative logwood and mahogany trades established by unscrupulous British buccaneers who first paddled up the river in the mid-17th century. According to local legend, the British invaders would ride up by horse or mule from surrounding settlements, set up camp for two to three days, and fit cricket matches around dory racing and other festivities. Sometime in the late 18th century (or early 19th century, depending on whom you believe), the Belizean Creole population - descendants of the loggers and the black African slaves imported to do the heavy lifting - took up the game and injected it with their own culture. "So it's Tillett, caught Tillett, bowled Tillett, given out by umpire Tillett, and recorded in the scorebook by scorer Tillett. And the next batsman to the crease is Tillett"
Soon entire villages were turning out to watch local derbies. Large crowds would cycle from village to village on weekends, a phenomenon that spurred one influential civil servant, Monrad Metzgen, to organise the colony's first cross-country bicycle race in 1928 - with pause for a cricket match at the halfway mark. 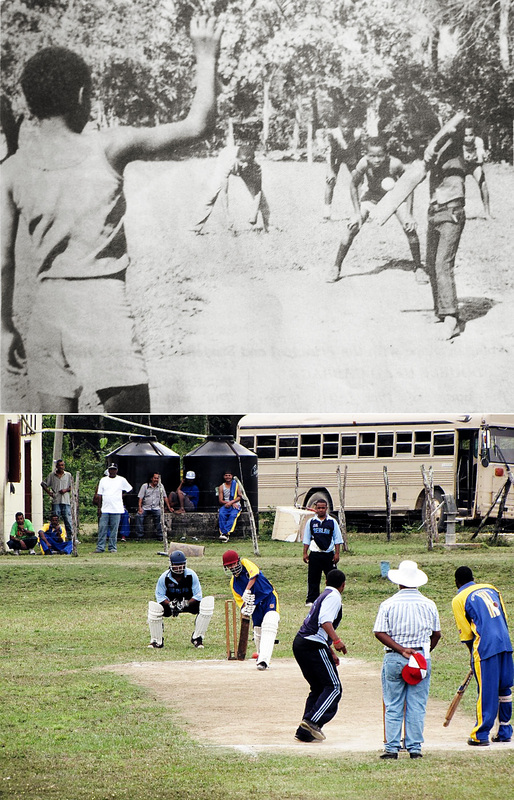 Unlike the more organised scene then found in Belize City, rural cricket carried a more informal feel until the early 1950s, when the first league competition was put in place. It has survived ever since except for the five years of recovery after the great flood of 1979, which devastated crops and livestock in the valley. If a society's love for cricket can be judged by the lengths that children go to play it, then the old logging villages in this valley pass the test. From the age of four, Conway Young would join older boys from the village of Bermudian Landing in games of bush cricket, carving a bat from the trunk of a coconut tree, and the balls from the fruit of the coyol palm. "We have this fruit called supa, which we shake down from the palm trees," he says. "We'd take a bicycle inner tube and cut it into rings, then wrap it up around the nut of the supa until it is big enough to be the size of a cricket ball. If you played for a long time, the ball would change direction dramatically, and it ended up looking like spin. Ever since then, spin has always been my favourite kind of bowling to face." At the heart of Bermudian Landing is the Community Baboon Sanctuary, where a voluntary preservation project was set up in the 1980s to safeguard the future of the black howler monkey. The screeching mating calls from canopies across the valley are as much part of the cricket soundtrack as reggae or brukdown. "The baboon sanctuary has been in my family all my life," says Young. "My dad, Fallet, was one of the founders, and my mum, Jessie, was the president of the women's group which took over the management of the sanctuary in 1998. I started doing my first guided tours when I was seven years old, and I never stopped." Young splits his time as a volunteer-administrator at the sanctuary with his role as cricket development officer for the Belize National Cricket Association (BNCA). If he swivels his chair towards the door, he can see the children of Bermudian Landing playing cricket on the village pitch, just as he once did. 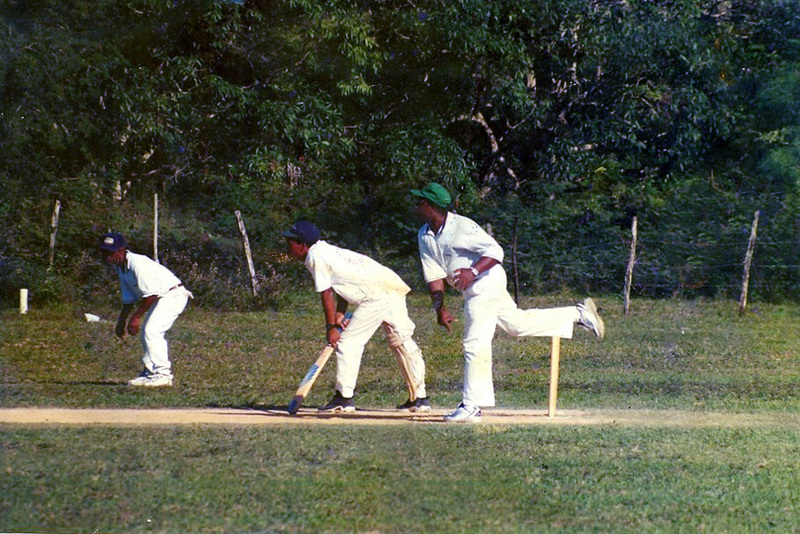 The teenaged Young was the great hope for Belizean cricket in the early 2000s. At 14, he was bunking off lessons to practise his batting. It paid off with centuries in school games, followed by an invitation to train with West Indies age-group teams. On international debut for Belize, at 16, in the 2004 ICC Americas Affiliates Championship, he struck 117 against Suriname - setting tongues wagging about a featherweight strokemaker from one of the smallest countries in Central America. Things never quite took off for Young, though he piled on domestic runs. 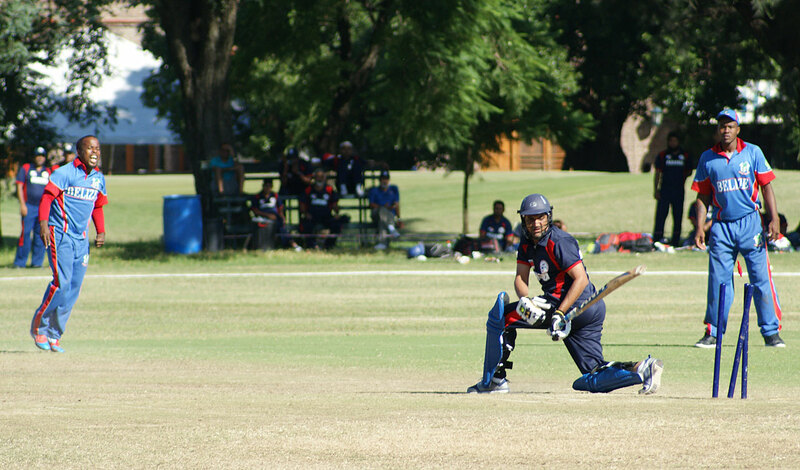 In 2010, after four months playing and coaching in Buenos Aires - a gig organised by ICC Americas - Young tried to sort a Grade cricket contract in Australia. But he couldn't satisfy the visa criteria. He admits this knocked his belief that he could make it outside of Belize. Last year he hoped to join trials for the combined ICC Americas squad to compete in the Regional Super50, the West Indies 50-over competition, but was turned down due to a lack of sufficient evidence of his domestic performances. Newspaper reports of his 200 not out in 2013 for Berlan of Bermudian Landing were deemed insufficient. Belize hasn't always been the best at collating cricket records; many of the earliest documents were swept away in hurricanes and floods. For 15 years Elston Wade combined his job as Belize Postmaster General with the voluntary presidency of the BNCA. Certificates, medals and shiny trophies - the kind favoured all over Central America - compete for space on top of his filing cabinet. "I remember sitting in this office in 1996," he says, "taking a call from the ICC, and being asked if we'd like to join the global cricketing family." These were cricket's years of plenty, when the ICC sought to expand with what historian Gideon Haigh once called "League of Nations-like idealism". ICC membership opened up unprecedented funding, and access to international tournaments, coaching and training courses. But with added money came complications. In 2008 there was an open rupture between the BNCA and one of its affiliate members, Belize District Cricket Association, and in March 2009 two rival leagues, each calling itself the Harrison Parks Competition, began almost simultaneously. Parks, a popular spinner, had died on the cricket field, and his widow had to issue an appeal to the two squabbling groups before fences could be mended. After almost 20 years of ICC membership, Conway Young is the only active qualified coach in Belize, tasked with developing the next generation of young cricketers. "There's just no way he can do it all," admits Jeremy McCulloch, the BNCA's new president. "He can't be in every village at once." Belize is blessed with a Creole population steeped in cricket culture, yet the country receives just $16,000 a year from the ICC, partly because so few of their coaches and officials have been through the formal processes. "I learned a great deal in Argentina about the way they went about things," says Young. "They only have about six clubs in the whole country, where we have almost 15 in this valley alone. But I've tried to instil parts of their attitude in Belize." YouTube could be a self-help tool for young cricketers - except that Belize has some of the slowest internet speeds in the entire region, and it is near impossible to get online in some rural areas. 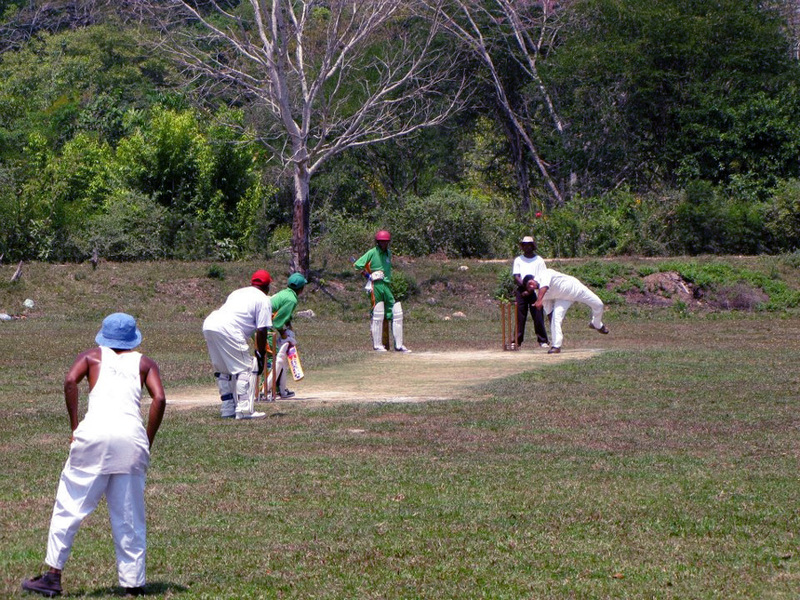 Belize's unique cricketing culture lives on. Rather than backing up when the bowler delivers the ball, it is customary for non-strikers to crouch with their bat or foot rooted behind the crease until a call for a run is made. Likewise, most fielders don't walk in. The catching and ground fielding, though, is frequently electric, and downright brave on some of the rougher fields. Then there is the lexicon: to be out hit wicket here is marked down as "murder wicket". To bowl spin is viewed with suspicion. 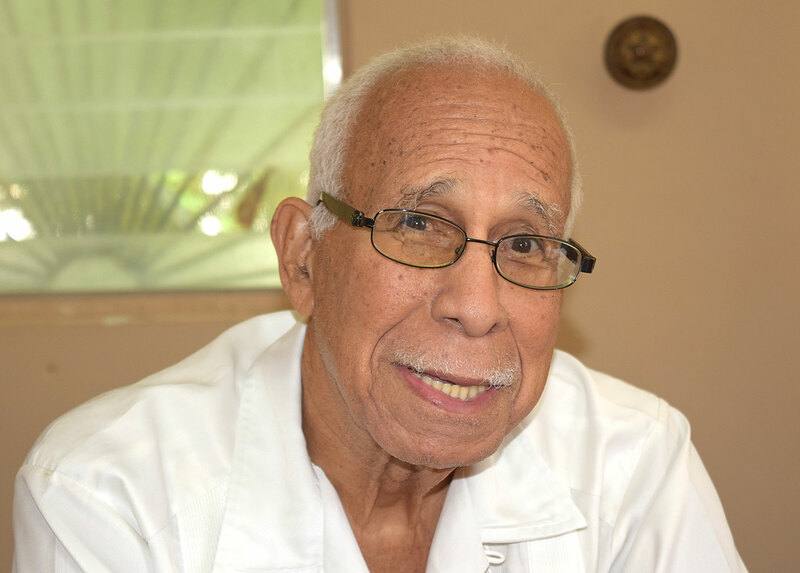 "They are macho people out in the rural," says 83-year-old Dean Lindo, a prominent attorney-at-law, founder of the ruling United Democratic Party, and author of a history of cricket in Belize. "Spinning is almost seen as effeminate. Our bowlers want to bowl fast and knock down the batsman's wicket all the time. They tend to forget they have 10 other people out there to help them. You see the difference when we go to ICC tournaments and our own batsmen have no idea how to play spin." As for protective gear, many of the older players shun batting gloves - or "tips", as they are called - and strap a pad onto their front leg only. Helmets are a relatively new addition. All this can be attributed to a cocktail of heritage, machismo, and economic reality. Brodies, the wholesalers, stopped stocking cricket gear years ago and equipment has to be shipped in, or passed on from the Belizean diaspora, from the US. Two years back, Michael Finnegan, a sharp-talking government minister - and uncle of the New York-based rapper Shyne - happened upon a game involving Bright Star of Sand Hill, and thought they could do with an upgrade from their old whites. He arranged for a contact in Texas to send the team some new coloured uniforms. Village identity runs so deep that each team is associated with its own style of play - usually a legacy of a particular family, coach or local conditions. At one cup final in the 1960s, the Crooked Tree team took along seven players by the name of Tillett, plus an umpire and scorer. Their opponents, Police, also had three Tilletts. "He's out, caught behind," exclaimed the delirious radio commentator, according to CH Godden's memoir Trespassers Forgiven. "So it's Tillett, caught Tillett, bowled Tillett, given out by umpire Tillett, and recorded in the scorebook by scorer Tillett. And the next batsman to the crease is Tillett." More recently, Brilliant of Crooked Tree have forged a reputation for technical correctness, which helped them win a string of titles in the last decade. McCulloch recalls a match when two of their batsmen batted through an entire innings for just 2 runs. Excellence of Double Head Cabbage are more reflective of the Belizean style, swinging hard and to leg. They once dismissed Bright Star for 13 in the first innings - and lost by 9 runs. When Richard Price, a wine merchant based in Belize City, turned up in the league in the early 2000s, his cautious approach to batting met with voluble derision, principally from women, who often outnumber men in the crowd. They had given up their Saturday afternoon to watch towering sixes and stumps flying out of the ground, and didn't take kindly to an Englishman diligently seeing the shine off the new ball. One season, Price finished second in the league's batting averages, much to the annoyance of many players. While teams will go to extreme lengths to save weather-affected games, it is not uncommon for them to abandon them in protest at an umpiring decision. In July 2014, Excellence halted a crucial Harrison Parks semi-final against Brilliant because they disagreed with the dismissal of their No. 9 batsman. The case was referred to the league's disputes committee, who ruled that the game should continue from where it left off. The next Saturday, four Excellence players turned up in Crooked Tree in an SUV to complete the chase (and lost). At least things did not spill over. In a match in Belmopan a few years ago, one batsman responded to being given out by running back onto the field waving a gun. He was an off-duty policeman. Lindo, who also served for several years on the disputes committee, had to draw on all his legal expertise. "I quite liked it," he says, smiling from the calmness of his downtown office in Belize City. "I went all the way out for the umpires, let me tell you." Each week during the season, Peter Young, the league scorer and archivist, rounds up the action for Amandala, a prominent left-wing national newspaper. His reports are always informative, and sometimes touching. More often than not Young signs off with a plea to players and supporters to respect their opponents, the umpires and the game. Belize is among the few countries in the world without a single McDonald's, Burger King or KFC. Rice and beans remain a popular tea at many cricket matches, sometimes served with roasted iguana and washed down with Belikin beer. Yet the decline of sport in Belize is often blamed on American influences - most pernicious of all, the flow of hard drugs through Central America to the US, and the gang violence that accompanies it. "In the last 20 years we've lost a lot of our young boys to crime and violence," wrote Evan X Hyde, the publisher of Amandala, in his thumping 2008 memoir Sports, Sin and Subversion. "The '70s were golden; the '80s became eerie. And the '90s were plain crazy." One team's recent experiences show how precarious life can be. In Lemonal, a village of just 150 people, cricket is the only competitive sport for men, while the women are renowned softball players. Some of Lemonal's best young cricketers were unable to break into Surprise, the village's established team, so they formed a rival side, Easy Does It. "At the start of the competition, this team was not a favourite of many," wrote Peter Young. "Insulting remarks were thrown at them. Some of them were rough on the team, who were thought of as being friends or family. But wherever they travelled, you would see their crowd following… not least [coach] Michael Muslar, who everyone could hear telling his team how to bat and how to bowl [out] who." They earned respect. Over the last year and a half, Easy Does It have experienced the worst agonies. In August 2014, they beat Brilliant in the two-day final to lift their maiden Harrison Parks title. Shortly after leaving the victory party in Lemonal the following Saturday night, one of the team's founders, 27-year-old Denvo Banner, was shot multiple times and dumped in a shallow grave behind St Luke's Methodist Primary School. Many believed it was revenge for the killing of Demsley Arnold, a lab technician, in Belize City. Seven years earlier, Banner had been charged with Arnold's murder, but walked free when the case broke down due to lack of evidence. Last May, Mykelt Anthony, an opening bowler for Easy Does It and the national team, narrowly escaped with his life after being shot in broad daylight in Belize City, as he waited to collect his bicycle. He appeared in a wheelchair to celebrate with his team-mates when Easy Does It retained their title last September. Both men, their relatives told the media, loved nothing more than to play cricket with their friends from the village. It is not easy to find feel-good stories about cricket in the Anglophone Americas. USA and Canada continue to be guilty of shocking waste; Bermuda are in disarray, and remembered around the cricket world mostly for a catch taken by a chunky policeman almost a decade ago. Perhaps this is no surprise: the Test team on their doorstep, West Indies, have been in headlong decline for 20 years. But there is a valley in Central America where a game of cricket is still capable of drawing out entire villages in rowdy celebration. There can be few places in the world where village cricket means so much to the people who play, watch and live it.